– the effect of an eight hour time difference on the body clock. Aeroplane fans would have appreciated the view from the hotel bedroom window of aircraft movements along the busy Los Angeles runways. After a leisurely hotel breakfast Operation Car Pick Up had to get under way. The baggage was lumbered back into a hotel courtesy bus to return to the airport where the driver, having dropped off all the other passengers at their appropriate terminals, did a detour to the lower street level to deliver the crew close to the car rental courtesy buses. So, nearer 11 am, bags loaded, car checked past the security guard, independent travel could begin. The satnav slowly registered the car’s position. Keen not to repeat last year’s mistake by inadvertently turning left into a less than salubrious LA area, the Captain turned right. Within three streets there was the freeway entrance. Eight lanes of highway stretched ahead. The miles ticked past and the vast bowl of the Los Angeles conurbation was left behind. Familiar place names cropped up: Long Island, Anaheim, John Wayne Airport… The freeway passes close to modern high rise buildings at Irvine and then as yet untamed territory appears, dry brush on steep sided hills. If you are unaware of your route first sightings of the Pacific Ocean may come as a surprise. The I-5 Freeway veers to the coast. On one small patch of the vast military training area that is Camp Pendleton two strange aircraft were in hover mode. They were V-22 Ospreys, designed to provide fast transport of troops over distance and directly onto a battlefield. Safely on the I-78 it was a 12 mile drive east to Destination San Marcos and the customary broad overviews from high up at Double Peak Park. “What do you think of our Trump election?” the hotel bus driver had asked earlier in the day. With no wish to get into conflict or to offend the Captain had replied: “So what did you think of our BREXIT…?” These opening gambits happened several times over the next few days. Folk are open to questions and will readily provide their own version of the causes of the election result. In the heat up at Double Peak Park four other sightseers described their own reactions and their own Election Night tales. Even youngsters have opinions. “Hillary lost,” said six year old Cal Guy Jnr, mournfully. “She’s old, like you…” (That came as an unexpected and unwanted vote of no confidence!) Still, a week later it seems strange to read in the press and to hear on TV the title President-elect Trump. As ever when in the US there is the realisation that while the English language might be shared, experiences and culture differ. “Really? So where did your Mom come from?” Boatwif felt compelled to ask. 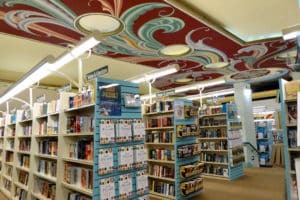 It was on Saturday while down in San Diego that Cal Gal (a serious book addict) mounted a campaign to find a book store. With only 70 pages left on her current read she feared a bookless weekend … Cal Son twiddled with his phone, located the nearest Barnes and Noble (a national book selling chain) – and drew up in front of a very unlikely building. A small sign on a side door said Barnes and Noble. What a surprise. The ceiling was a breathtaking swirl of deeply coloured pattern. and the handrails up the slopes. has apparently been a book shop since 1984. It was a chance finding of a building which has been perfectly re-purposed! What else has been rather unexpected in these first few West Coast days? As for the $2,000 dollar car rental charge, the Captain’s complaint reached the highest levels of customer service operation at Net Flights – and by Monday morning a satisfyingly humble apology had been received from Dollar Rentals.